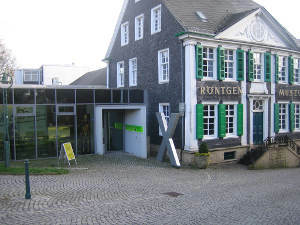 The German X-Ray Museum in Remscheid-Lennep was founded in 1932. Wilhelm Conrad Roentgen, who discovered the Roentgen- or ”X”-rays, was born only 150 meters from this house, where he once lived, which now serves as a library for the Roentgen Museum. It is the foremost task of the internationally appreciated museum to exhibit the results of Roentgen’s own studies as well as the physical and clinical aspects of the topic in an instructive way to a wide audience. The museum maintains a unique collection of equipment for applying ionizing radiation.